Suspenders -- Santa Claus wears them, lumberjacks wear them, southern gentlemen wear them and maybe your grandfather wore them. The fact is, suspenders are often thought of as accessories worn by older men, English "dandies" and, well, those who tend toward the eccentric. But listen up fashion-forward hipsters: Suspenders can add flair to your wardrobe without making you look like you stepped out of a 1940s movie. Plus, there are surprising benefits for those who choose to wear suspenders instead of belts. Suspenders are must-haves for formal wear -- such as tuxedos -- and it's considered a fashion no-no to wear both suspenders and a belt. Suspender wearers should also wear them with the proper trousers, that is, ones with no belt loops. Wearing suspenders allows trousers to hang properly from a man's frame and are more comfortable to wear than belts. Suspenders fasten with metal clasps or button loops. Metal clasps fasten easily and quickly but can damage cloth. On the other hand, button loops attach to buttons sewn into trouser waistbands, eliminating potential damage. Men who carry extra weight should always avoid wearing pants "below the gut, " and suspenders can help with this. Suspenders keep trousers at a man's proper waistline and prevent shirts -- and pants -- from becoming unattractively bunched up. Suspenders help the wearer to maintain good posture which, in turn, keeps the organs and skeletal structure in proper form. Belts actually mimic tourniquets at the waist. They can cause abdominal discomfort, displace internal organs and affect circulation. Suspenders cause the wearer to keep good posture because slouching will result in droopy, sloppy looking pants. For men who carry extra weight, suspenders create a vertical eye path that's slimming to a portly frame. 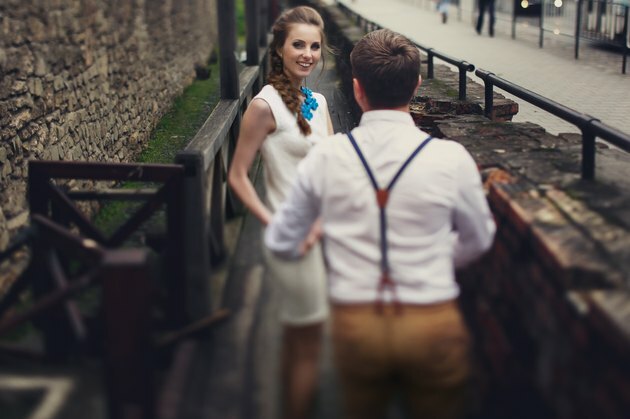 Wearers can create many different looks with suspenders, making them versatile. Thin suspenders can be worn over T-shirts for an edgy, punk-inspired look. Thick suspenders can be worn under a suit coat for that smart, Wall Street look. Try wearing suspenders made of striped silk over a dress shirt and suit trousers for a hip yet sharp professional alternative to a suit coat. If you're going for a casual office look, pair suspenders with khaki slacks and a dress shirt with rolled-up sleeves. Does a Tuxedo Shirt Look Better With or Without Studs?